This novel was the #6 bestseller in 1964. I had heard of the author, often written about in reverent terms, but had not ever read him. He wrote 31 novels spanning his writing career of 60 years, served as President of the American Academy of Arts and Letters, and received the National Medal of Arts. Because he was known for continuing the tradition of Henry James and Edith Wharton in writing about the 20th century American upper class, I was not drawn to seek him out. I must admit that his writing is good and much smoother reading than James or Wharton has been for me. The Rector of Justin would fall into the genre of boarding school fiction. 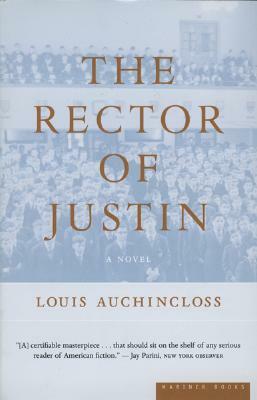 A rector is a headmaster and Justin is an Episcopalian boarding school outside Boston. Francis Prescott is its founder and aging rector, fighting off retirement as the world changes around him. Essentially the novel reveals the Rector's life story through the viewpoints of various people including his oldest friend and his rebellious daughter. Like most people, he has many sides to his personality but since he is such a personage with power over boys aged 12 to 17, as well as having a Board of Directors to appease, all of those sides get full play. I enjoyed reading the book for the range of decades it covers. Wealth does not ensure good behavior. As the 20th century progressed the exclusivity of Justin was encroached upon by the rising middle class and the loosening morals of the times. Bad behavior is where you find it. An aging man, part authoritarian martinet, part moral fusspot, tempered somewhat by his Christian beliefs, Francis Prescott is a personification of 20th century New England and the uneasy relationship between its social classes. I would have read this book regardless due to the bestseller list so I was pleased to have learned a few more things about those times and to have been entertained by a variety of unique characters. You find the most interesting books to read! This one sounds like a good one to add to my ever growing reading wishlist. I don't recall ever hearing of Louis Auchincloss before reading your review today. I find them because of My Big Fat Reading Project, created by me in 2005. Part of the project is to read the top 10 bestsellers of every year that I have lived. That is where this one came from. Sounds interesting, both the setting and, per your review, the development of the story. I hope New England has evolved somewhat from the divide you speak of; at least it seems less apparent, I think, because of the diversity of the population nowadays. Oh I am sure it has changed plenty in 50 years or so. I forgot that you live there. Catching up with my blog reading. I read one Auchincloss novel many years ago and now I can't even remember which one, although I'm sure it wasn't this one. Apparently he didn't catch my imagination because I never went back to him. Good to have you back! I would not read another of his except that he had one more top 10 bestseller. Still it was another interesting take on class in America.